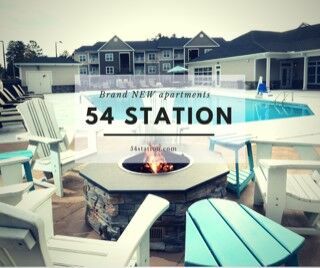 "54 Station’s brand new apartments offer you an urban escape, balancing work and play. Our smart apartments with “tech extras” you want, like Wi-Fi throughout the community, smart locks, and thermostats that work from your phone. You’ll enjoy details like granite countertops in kitchens and baths, faux stainless steel appliances, luxurious plank flooring, conveniences of washer and dryer in your home, and large private outdoor space with storage big enough for your bike! Meet up with neighbors at the resort style pool with grilling cabana, the fire pit, on Food Truck night, or at a myriad of other neighborhood events. Stay connected with Wi-Fi throughout the property, off-leash dog park, electric car charging station, and 24/7 gym with Precor cardio fitness and strength equipment. Only minutes from Downtown Durham, Research Triangle Park (RTP), Duke, and the University of North Carolina, you’ll have time to work and play at the Streets at Southpoint where dining and shopping are only minutes away!"